The new year symbolizes renewal and new beginnings, which is in harmony with the Water element in Traditional Chinese Medicine (TCM). 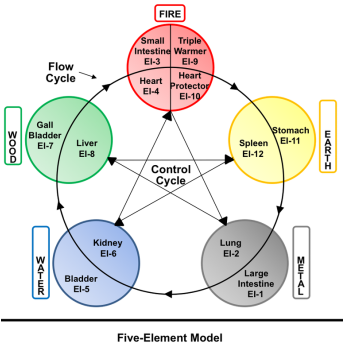 The Water element signifies restoration and is associated with the Bladder and Kidney meridians (mapping to EI-5 and EI‑6, respectively). In the TCM Five-Element Model, there is a Flow Cycle that moves energy in a clockwise direction from one element to the next. Yin meridians are located on the inside of the circle, whereas Yang meridians are on the outside, creating two parallel flows—one among the Yin meridians, the other one among the Yang meridians. Yin meridians (such as Kidney) bring energy in, while Yang meridians (such as Bladder) move energy out of the body. The Kidney meridian serves the kidney organs and governs bones and teeth. It begins at the bottom of the feet at the so-called Wellspring of Life points and is said to contain the life force of beginnings and renewals. The function of the Kidney meridian, like that of the kidneys themselves, is purification. The Kidney meridian filters toxic energy, allowing energies that have been obstructed to begin to move. Kidney meridian’s partner on the Water element is Bladder. Bladder meridian serves the bladder organ and governs the nervous system. It receives Kidney energy and uses it to transform and eliminate fluids. Its associated integrator (EI-5) regulates the lymphatic system. To support the process of eliminating what no longer serves us and enabling new beginnings, a useful technique is to help drain the lymphatic system. The NES miHealth device provides a unique tool for a gentle, effective, and efficient bioenergetic protocol, similar to what was included in the Quantum Health booklet, NES Practitioner Introduction to Beauty. Before getting into the details, let’s review some background information on the lymphatic system. The lymphatic system is the body’s waste-removal system (sort of like a "quantum" liquid plumber). All kidding aside, it's vital for its immune functions. It is a network of organs, nodes, capillaries, vessels, channels, and ducts that make and move lymph from tissues to the bloodstream, directionally towards the heart. Its largest organ is the Spleen, which is connected by a network of tiny lymphatic vessels to clusters of lymph nodes throughout the body. The figure below depicts the structure of the lymphatic system, along with the specific fields that are analyzed in a ProVision scan. ﻿Lymph nodes are collections of lymphoid tissue with a fibrous capsule. There are several hundred lymph nodes distributed throughout the body; the highest concentrations are found in the neck, around the collarbone, in the armpits (axillary), and in the groin regions (inguinal). Click here for interactive illustrations. Lymph is a clear or slightly yellow fluid containing T-cells and B-cells (the immune system’s infection-fighting lymphocytes). It circulates through channels that carry waste to the lymph nodes. The lymph nodes then filter out toxins, preventing them from entering the blood stream while allowing lymphocytes to pass through. A special type of lymph, known as chyle, is produced in the digestive system as lymph absorbs triglycerides from the intestinal villi (small, finger-like projections that protrude from the epithelial lining of the intestinal wall). Due to the presence of triglycerides, chyle has a milky white coloration to it. Unlike the cardiovascular system which is powered by the heart, the lymphatic system does not have its own pump. Lymph is transported through lymphatic vessels by skeletal-muscle action—contractions of skeletal muscles constrict the vessels to push the fluid forward. Check-valves prevent the fluid from flowing back toward the lymphatic capillaries that feed the lymphatic vessels. All of the lymphatic vessels carry lymph toward two lymphatic ducts: the thoracic (or left lymphatic) duct and the right lymphatic duct (click links for detailed pictures). These ducts serve to return lymph back to the venous blood supply so that it can be circulated as plasma. The thoracic (or left) lymphatic duct connects the lymphatic vessels of the legs, abdomen, left arm, and the left side of the head, neck, and thorax to the left brachiocephalic vein; the right lymphatic duct connects the lymphatic vessels of the right arm and the right side of the head, neck, and thorax to the right brachiocephalic vein (click links for additional illustrations). Lymph circulation can be blocked, leading to symptoms like enlarged lymph nodes, edema (swelling of soft tissues as a result of excess fluid accumulation), under-eye puffiness, and cellulite. Lymph circulation can be stimulated through active exercise, deep diaphragmatic breathing, massage, as well as bioenergetic approaches. A very gentle lymph-drainage technique involves use of the NES miHealth device in either on-body or off-body (broadcast) mode. You will be drawing small, clockwise circles, either lightly touching the body or a few inches above the body, following the primary lymph-drain patterns from the ankles and the wrists to the heart area as illustrated in the picture and described in the step-by-step instructions below. This protocol can be used by itself for detoxification, immune-system support, and whole-body rejuvenation. It also integrates well with any type of body-cleansing, stress-management, weight-loss, personal-training, health-coaching, anti-aging, or general-rejuvenation program.